On September 17, John Buchanan visited two of Kerry Sylvia’s D.C. history classes at School Without Walls (DCPS). 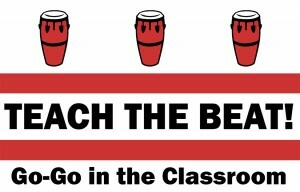 In advance of the lesson, students participated in an introductory activity called “Meet the Beat” about go-go. This visit was one of many by noted go-go performers and scholars that took place at schools across Washington, D.C. Here are some reflections from the students about Mr. Buchanan’s visit and their preparation for it.